The SpikeSafe™ 5A Performance Series Current Source (PRF) supplies precision DC, continuous pulse, and single pulse current with excellent pulse fidelity. Output pulses have microsecond rise and fall times – key to precise LED photometric and electrical measurements. A precision hardware-controlled timing system supports pulse widths from 10µs to 15000s. Programmable load tuning alters the SpikeSafe current regulator response to compensate for load conditions, cable impedance, and length. Hardware triggering ensures measurement repeatability. Continuous power conversion technology means no duty cycle or pulse width limitations. An optional bias current module supports junction temperature (Tj), thermal resistance (RΘ), and dynamic thermal impedance measurements. Devices being tested are protected with a gentle turn-on during ramp-up and with SpikeSafe load protection during operation. SpikeSafe load protection continuously monitors voltage and current patterns and instantly shuts down the drive current when device anomalies are detected. Bias Current – constant DC bias current. Generally used for Tj measurement and K-factor determination. Modulated Current – develop and execute your own current waveform shape. Software Development Toolkit – develop and execute SCPI sequences speeding software development. Control Panel Application – Provides familiar source/measure capability using an external sampling digital multimeter (DMM). Control Panel can also coordinate data from an Instrument Systems CAS-140 spectrometer. 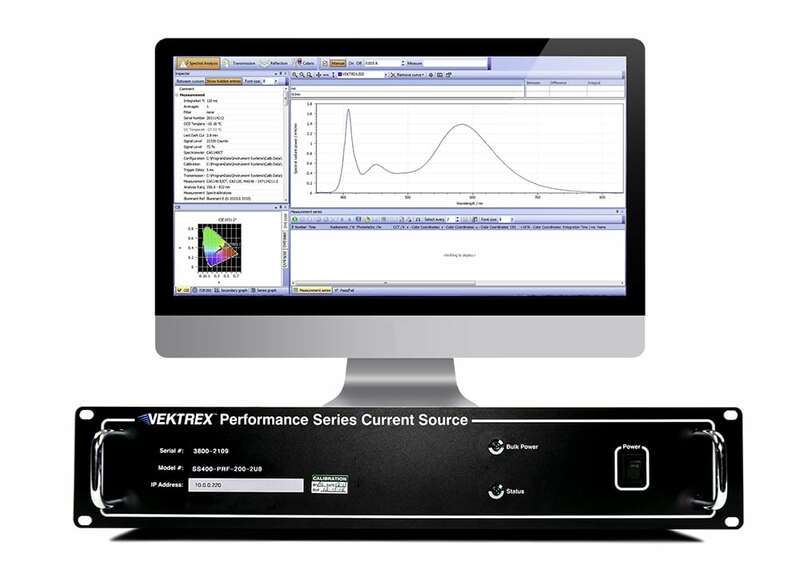 The Vektrex Control Panel software application provides turn-key control of the SpikeSafe current sources and optional high-speed sampling voltmeters and spectrometers. This software pairing provides familiar LED and laser diode source/measure capabilities with the added benefit of high-speed sampling, pulse visualization, and light measurement. For customized software development, the SpikeSafe Software Development Tool is an interactive SCPI sequence builder. This tool speeds development by enabling the build and execution of complex command sequences. Other software supports additional test applications including RΘ, Tj, modulated current, and reliability testing. Performance Series Current Source with SpecWin Pro shown. 5A 44.7V Precision Pulse with 958.6ns rise time.